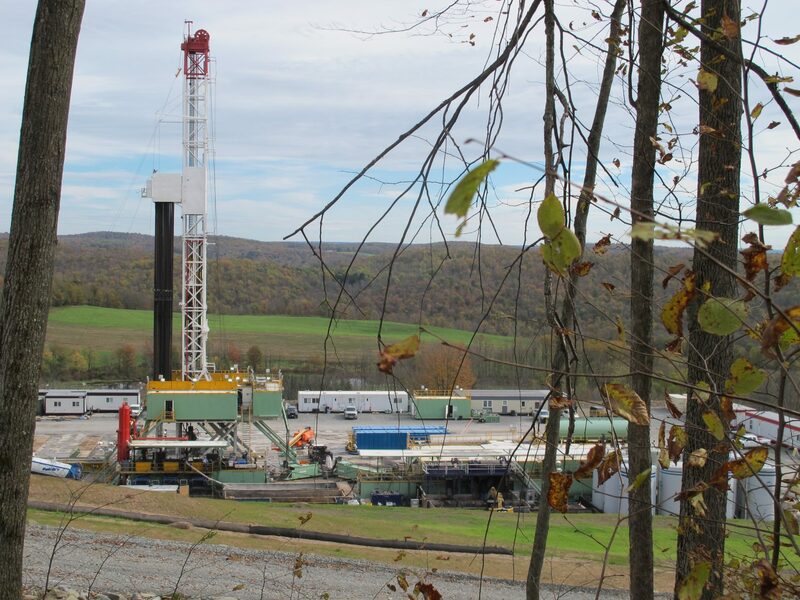 A natural gas drilling site in Susquehanna County. The state Supreme Court struck down several controversial portions of Act 13 today. The 2012 law made major updates to the rules governing Pennsylvania’s oil and gas industry. In a 4-2 decision, the court held that portions of the law dealing with restrictions on local zoning violate Pennsylvania’s constitution. Chief Justice Ron Castille was joined by justices Todd, McCafferty and Baer in the majority. Justices Saylor and Eakin issued dissenting opinions. One section of the law found unconstitutional called for statewide rules on oil and gas to preempt local zoning rules. Another section required municipalities to allow oil and gas development in all zoning areas. They cite Pennsylvania’s history with coal and timber as lessons which lead to the amendment. Jordan Yeager is an attorney with Curtin & Heefner, representing local governments who challenged Act 13. Yeager says towns still can’t zone out oil and gas development entirely. The portions of Act 13 that were struck down had tried to remove their discretion on where it could go. Environmental groups also applauded the decision. “This ruling is a victory for our local communities, whose interests the Corbett administration has consistently put behind that of the oil and gas industry” said Sierra Club Pennsylvania Chapter President Jeff Schmidt. “We are heartened to see that the Court recognized this massive overreach by the Pennsylvania legislature is indeed unconstitutional,” said Erika Staaf, of PennEnvironment. Governor Corbett issued a statement expressing his disappointment with the decision. David Spigelmyer, president of the gas industry trade group, the Marcellus Shale Coalition, echoed similar sentiments. “Although we will continue to collaborate with communities across the Commonwealth, today’s decision is a disappointment and represents a missed opportunity to establish a standard set of rules governing the responsible development and operation of shale gas wells in Pennsylvania,” he said in a statement. The court also found another section of Act 13 which allowed the Department of Environmental Protection to grant waivers for setback requirements from water sources to be unconstitutional. The justices also weighed in on the so-called “doctor gag rule” of Act 13. The language in the law has some medical professionals concerned they could get in trouble for disclosing chemical trade secrets associated with gas drilling. The high court says that legal challenge can continue and it was sent it back to the lower Commonwealth Court.